Miriam Zora Engel was born in Minnesota but raised between rural South Carolina and Seattle, Washington. In 2009, she returned to the Midwest to attend the School of the Art Institute of Chicago where she received both her Bachelor’s degrees, a BFA in Painting and Drawing as well as a BA in Visual and Critical Studies. Predominantly exploring subjects of perceptual experience, memory and color, Miriam paints with a variety of media including gouache, watercolor, oil, and homemade egg tempera. In 2014, she was awarded a merit scholarship to attend Oxbow School of Art’s winter painting program in Saugatuck, Michigan. She has worked on various mural projects in Chicago as well as in Latin America. She currently lives on the island of Oahu. Melody Revnak is an award-winning professional photographer who has made her home in Hawaii for over 25 years. Her attention to composition detail, recognition of optimal natural lighting and technical proficiency are all products of her professional training from a leading San Francisco portrait photographer. Her extensive portfolio includes beautiful images of island floral, landscape, seascape and sea life as well as images taken over the course of her travels. Though intrigued by many mediums, Oak appreciates the starkness and simplicity of pen and ink for challenging one’s artistic skills. With so little room for error, he understands the need to be confident of each marking and equally sure of the effect of its absence. Unmarked space is integral to the finished product. Having lived on both coasts and now calling Hawaii home, Oak appreciates the subtle and not-so-subtle differences found in his surroundings. He makes a conscious habit of drawing figures and objects unfamiliar to him, believing doing the unfamiliar helps to pinpoint one’s focus and ability to truly see the subject matter. Self-taught and passionate about capturing the intricacies of his subject matter – whether portrait, landscape, still life, or technical, Oak strives to perfect his craft. The expressions captured in his portraiture's are a testament to his desire. His hope is to create images which will stand the test of time and attest to his commitment. Garret Kojima has always had a passion for the ocean. Born and raised on the beautiful Garden Island of Kauai he would often be found enjoying the rush of the pounding surf, and diving in the deep blue sea. Garret attended the University of Hawaii where he was awarded a six month internship with Walt Disney Imagineering. This experience was definitely an eye opener, and a segue to the incredible potential for his career in art. Garret enjoyed the excitement of living in Los Angeles, but the warm waters of Hawaii called him back home. In 1997, Crazy Shirts hired Garret for his creative spark, and artistic talent. He consistently pushed the boundaries in t-shirt design, and was eventually awarded "Artist of the Year" for his innovative "Tribal Series". While at Crazy Shirts, Garret met famous Disney artist Eric Robison who opened his eyes to the magic of painting. He discovered that he could express his passion for surf through powerful brush strokes, and bold colors. Bright colors danced across his canvas. Art came to life. A trilogy of old loves, passions, and the magic of Disney merge to create his own unique surf art from the heart. Angela Tisseraud was born in Italy where she acquired her passion for art and beauty. In her pursuit to see the world, while living in the middle east, she found her soulmate and sailed to Tahiti, It was there, submersed in the lush nature and intense colors of the blu' lagoons, that Angela began infusing the vibrant colors and beauty of her Italy with Polynesia. Each design begins with painting on canvas, then, Angela chooses from her favorites to hand paint on the silky pareo fabric. Every layer of color is dried in the sun. one at a time, to create the vibrant watercolor effect. The century old tradition of painting on fabric is a painstakingly "hands on" process that produces one of a kind, unique pieces that could never be duplicated by machine! "The pareo", by it's multiple colors, prints and way of tying it, adapts to all personalities, to all skin shades. to all fashion decor. Its simplicity, allows travel with only a few pieces of garments in its luggage while cruising the green emerald coast of Turkey, Italy, Greece, or the blu' lagoons of the south pacific. 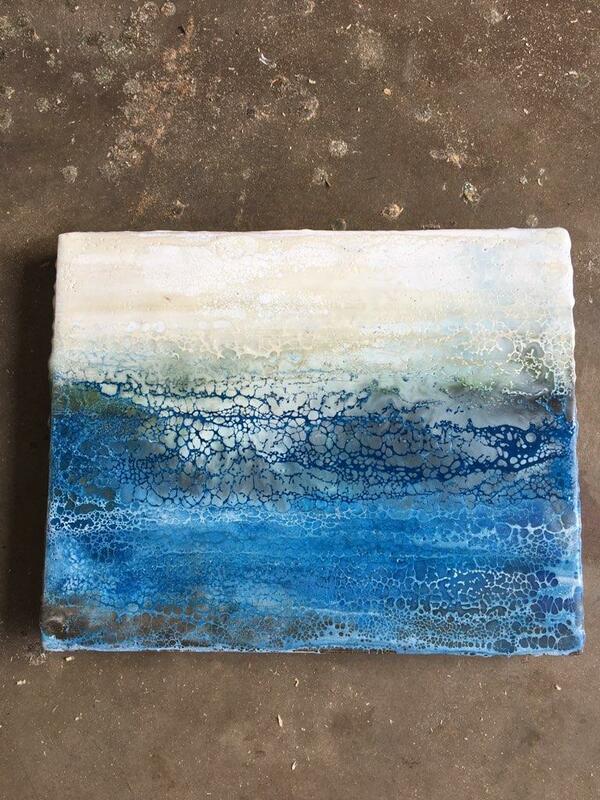 Sarah Caudle is a Hawaii-based abstract and seascape artist who creates a visual escape to paradise for others to find a sense of peace, happiness, and aloha. Inspired by nature and the sea, she depicts the beauty of Hawaii through dynamic colors, fluid movements, and organic compositions. Using acrylics and resin on wood panel, each original painting is completely unique and full of depth. As light reflects off the glassy surface of the resin, the complexities of the multi-layers are revealed, conveying a sense of wonder. She builds up each piece one layer at a time, carefully controlling the flow of the resin, while allowing it to settle on its own. This style is a way for her to explore her thoughts without constraint and find peace and beauty in the unknown. For her, art is more than something pretty to look at; it is about expressing emotions, creating an experience, and connecting with others. When she is not painting, you will find her swimming or surfing in the crisp clear ocean, practicing yoga under the warm sun on a sandy beach, or hiking through the jungle in search of hidden waterfalls. She is in constant awe of the unique beauty of Hawaii, which is expressed through her art. 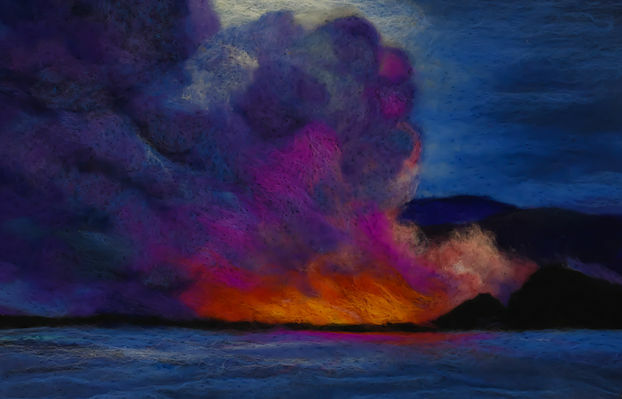 Suzanne Towry-Pourroy is a fiber artist who uses exotic, colorful fibers such as merino wool, tussah silk and bamboo top to create stunning felted paintings. Beautiful natural landscapes are her inspiration. "I create earthy,woolen pictures of seascapes and landscapes from the natural beauty of the outdoors. If I can engage someone with my artwork, draw them in to a calm, centered place for a moment, and perhaps inspire them to go outdoors, then I've achieved my creative vision." When she's not teaching yoga on Ko Olina's beaches, modeling, or rock climbing, artist Nicole Zuelke can be found horseback riding thru the rustic beauty of Oahu's tropical forests. She first developed her deep love for horses at the side of her mother, and grandfather, famed sculptor, Richard Zuelke. Nicole grew up competing with her horses in various events involving cattle. Everything from small town Team Penning's, to the National Reined Cow Horse Association. Her intimate knowledge of her subjects, derived from having spent a lifetime around them, have been beautifully conveyed in paper and steel in her new series Bos Taurus. Kealoha was born on the Island of Moloka'i in 1951. He spent most of his childhood growing up on the Island of Guam. After graduating from The Kamehameha Schools in 1969, he went to the California College of Arts and Crafts on Oakland, California. Circumstances forced him out of college and basically put his art career on hold until 1983. It was at this time that he became involved in the contract furniture business and worked extensively in Asia with various furniture manufacturers. During his tenure in Asia, he became aware of the wood batik process and plunged right into learning everything he could about it. Kealoha's subject matters are as diverse as his nationalities. Being of Hawaiian, English and Chinese decent, his artwork also reflects this diversity. From Tropicals to Orientals and contemporary graphics, his works are surely colorful and appealing to many. His works have been exhibited at various eateries throughout Hawaii including; Sam Choy's, Nick's Fishmarket, Verbano's, Jarron's, Orson's Seafood, Wong's Okazuya, Isana's, the Honolulu Club, Pizzazz, Da Kitchen, Gordon Biersch and many others. 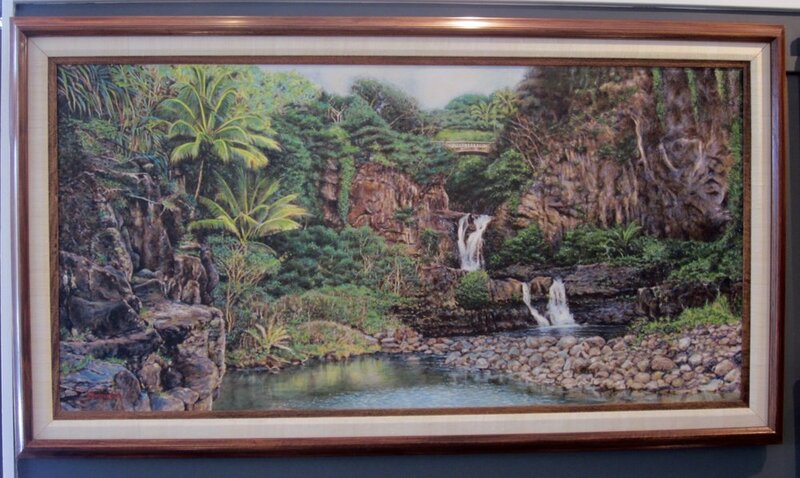 His artwork has been sold and shipped to collectors in Japan, Australia, New Zealand, England, Germany, Canada, Guam, Saudi Arabia, the continental United States and here in Hawaii. I was born and raised in Honolulu and developed an interest in Art as an adult working for the Honolulu Police Department. Art became my sanctuary from my job, and I drew furiously for a year, while a friend sent my drawings to art colleges on the mainland. I chose Art Center in Pasadena and ventured off to California. After Art Center, I pursued a career in television and design that led to numerous awards, including the New York Film Festival Award for a documentary he co-wrote and directed. I also designed the CBS promotional Fall Campaign in 1986 and followed with the Star Wars Congressional Presentation for Ronald Reagan with Bob Able and Associates. I retired soon after that to concentrate on my own Art. I convey many moods in my work and am more interested in the effect of a subject than its correctness. I like to explore all facets of art from music to poetry, sculpting to stage plays. I want to touch, to feel everything. As a Seattle native, I’m endlessly inspired by Hawaii,” she says. “The shapes of the crashing waves, the colors of the flora and rainbows, and the unique textures of the earth influence every painting." ”Years ago when I was learning to paint, I focused on copying photos or recreating paintings by masters like van Gogh. I learned a lot about painting techniques through trial and error, but unless my pieces looked exactly like the images that inspired them, I would feel disappointed. Gradually I learned to embrace my own style as an abstract impression painter. When I paint a wave now, I don't want it to look like something that already exists. Instead of focusing painstakingly on realistic detail, I trust my instincts, have fun with technique, and create from my imagination. When I’m true to my style I never feel disappointed with the finished piece." Jenna lives in Ewa Beach, Oahu with her husband and their free-spirited beach boy. John Baran is an artist and photographer from Santa Barbara, California. His art can be found in stores and galleries in California, Texas, Hawaii, Grand Cayman and Brussels, Belgium. 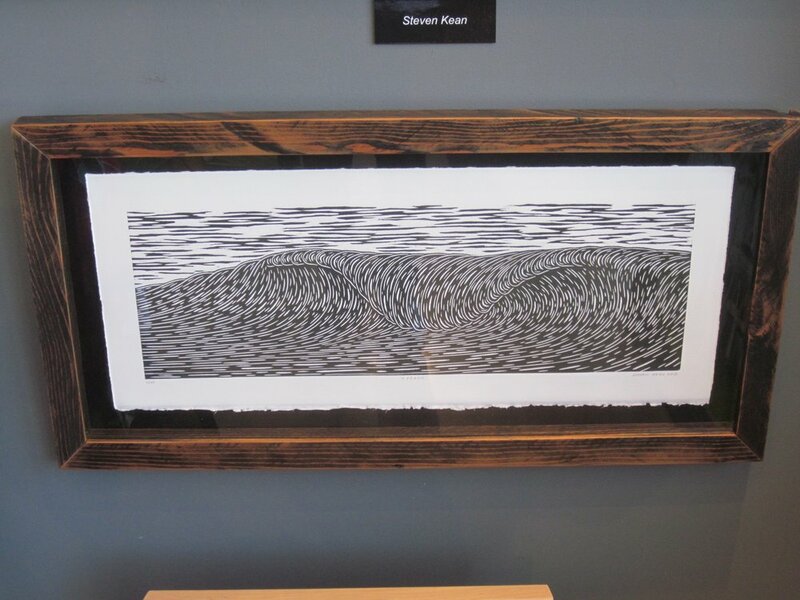 Some of his prints can be seen on the set of the hit television show, 'Hawaii Five-O'. An avid and accomplished photographer, John travels the world photographing his subject matter. His experiences with the animals in their natural environment is an integral part of the painting process. Photographing, sketching and spending time with these animals and watching their behavior helps John create works of art that are vibrant and full of life. He has swam with sharks, giant manta rays, manatees and dolphins. He has also come within feet of white rhinos, cape buffalo, leopards, lions, American alligators and African elephants, to name a few. All of these experiences have resulted in works that are a colorful fusion of abstract art and animals from the land, sky and sea. 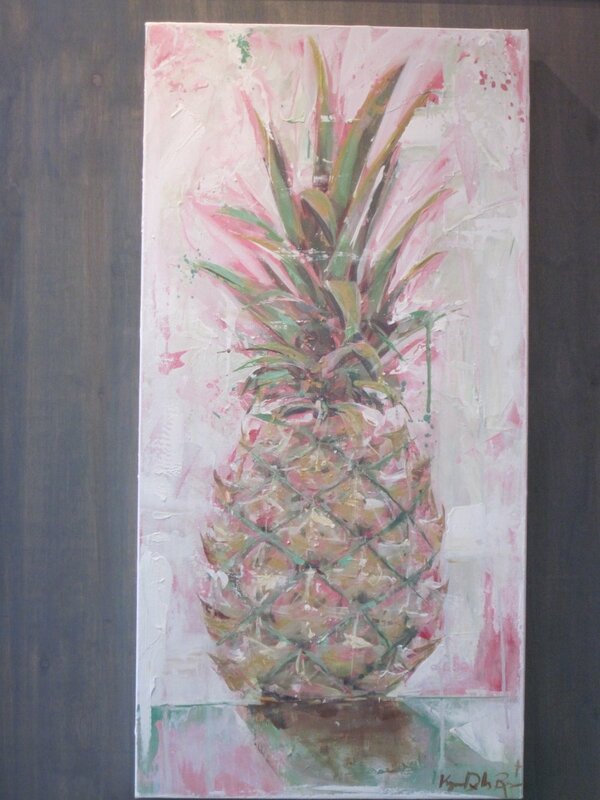 Playful yet sophisticated, his art is versatile enough to hang in a living room or a child's nursery. Tim Nguyen lives on Oahu, Hawaii and his oil and lacquer paintings are exhibiting through out Hawaii, Asia, Europe, and America. Tim’s art is collected worldwide and sought after for both his creative expressions reflecting the culture and beauty that surrounds him as well as his sensitivity and mastery of the medium. Tim Nguyen was always interested in art as a child. Tim began his career as an interior designer, yet ever since he can remember, painting has been his favorite form of self expression. After a visit to the Hawaiian Islands in 2001, Tim was so inspired and he decided to live here in the island of the Oahu. His first career in Hawaii as a taxi driver took a back seat. Tim got a shot of encouragement while showing ands selling his work at the Zoo Fence in Honolulu on a Sunday afternoon. After early success Tim parked his taxi and began painting on a full time. His brush has lead him many places including many trips back to his roots in Vietnam where he created and currently manages a lacquer painting factory. Tim paints with his power of emotion. This energy is apparent to anyone who looks at his work. Kym De Los Reyes is a versatile, energetic painter who specializes in colorful abstracts and impressionistic figurative/subjective work. A native Southern-Californian, Kym is establishing a presence in her community and nationally. Her work is currently being collected through-out the U.S. Her art has been exhibited and sold in Lorimar Winery Art Gallery and at the Truax in Temecula, CA. She had been represented by The Gallery Downtownin Pomona, CA. where she had her first solo show. Through The Christenberry Collection in Columbus, S.C. and Dogwood Home in Clayton, G.A. her work has been collected by clients all over the east coast! Kym holds a Bachelor’s of Fine Arts from Cal State University, Long Beach. She is a faithful, happy wife and blessed mother of two! 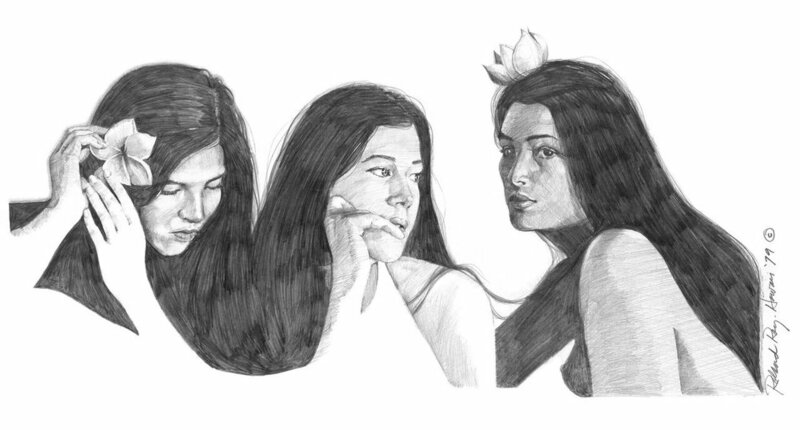 Seikichi Takara, a self-taught artist born and raised on the island of O'ahu is a second generation American of Okinawan ancestry. 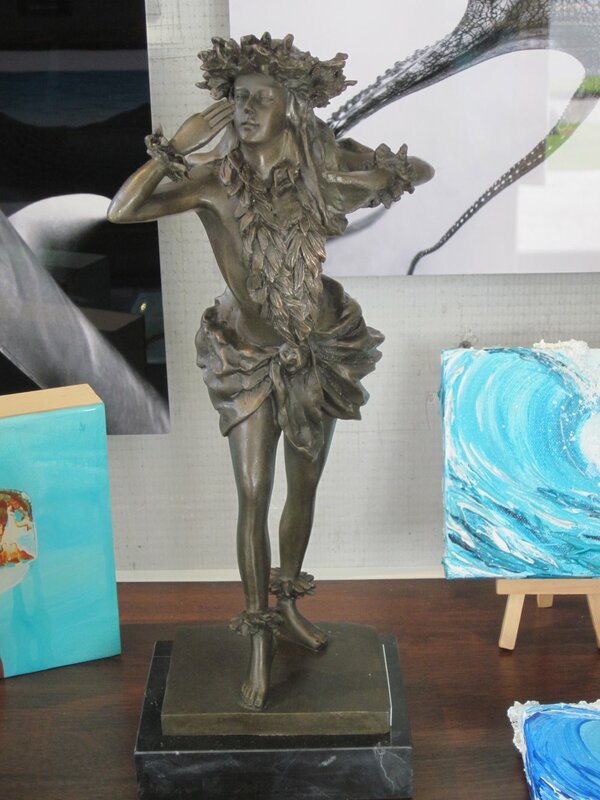 Takara's works are in many private and corporate collections including the Hawaii State Foundation on Culture and the Arts. A lifelong resident of Hawaii, Lee has worked in both Graphic Design and FIne Arts for over thirty years, specializing in graphics, computer artwork, industrial design and painting landscapes and portraits. An avid bodyboard enthusiast in the ocean, Lee's landscapes capture the beauty of Hawaii's tropical beaches and exotic flowers. His work achieves realism and depth using the same underpainting and layered glazing techniques employed by painting's Old Masters. Lee paints from his studio located deep in quiet Palolo Valley. With a lifelong passion for mermaids, Kariel has transformed her childhood dreams into a groundbreaking career as a professional mermaid to inspire happiness and possibilities and has created on going theatrical water show for some of the world's top resorts for nearly a decade. Kariel's mission is to use her talents to inspire others to believe in themselves, bravely follow their dreams, share their own unique talents so they can make a positive impact in our world. My name is Faisal Warsani and I am a tropical landscape artist. Painting is a way for me to transport myself to other places. My art brings me back to Hawaii, where part of my soul belongs. And it takes me to places I have yet to see, far out in the Pacific. I am inspired by the beauty of the sea and the swaying of palm trees. Whether I am creating waves or mountain ranges, I'm most content when I am captivated by nature's designs. Thuy Bui is a designer and painter from Hanoi, Vietnam. Thuy moved to San Francisco in 2013 to continue her art career and she also began to visit the Hawaiian Islands. The natural beauty and colorful images stayed with her long after she returned home, compelling her to move to Oahu and capture its beauty and culture in her most recent artwork. Thuy’s own unique art combines watercolors, acrylic and oil with the very traditional materials of rice paper, lacquer on wood and silk from her native Vietnam. To choose full time painting as a lifestyle is also to add another dimension to her spiritual life. Thuy paints with a quiet passion and emotion. There is a fine line between reality and illusion in her paintings, and it speaks to an ephemeral dreamland that only exists in her deep instinct. Kean holds a B.S. in Art Education from Temple University, Philadelphia, PA and is a current member of the Honolulu Printmakers. A devout family man and master craftsman, Gecko created South Sea Arts 17 years ago, selling small carved tikis and has now expanded his repertoire to include collectible tiki mugs, authentic Polynesian art, artifact replicas, and custom work for individual and corporate clients. Born on the islands, Gecko's love for art started at an early age of 8 years old. Gecko has since gone on to carve pieces for various musicians, restaurants, and homes all over the globe. Cameron “Cam” is an underwater photographer utilizing his passion and creative perspective to inspire positive action on behalf of our ocean and its inhabitants. Working on the West Side of Oahu with various pelagic species has allowed him to share experience and knowledge with people from all corners of the world. Strengthening the connection between people and nature has become his ultimate goal. By sharing visually stimulating imagery from numerous marine interactions, he hopes to leave every person with a deep sense of appreciation for the natural world. On a remote island in the middle of the Pacific, deep in the lush rainforest, just miles away from an active volcano, you can find artist Jacob Medina working on one of his whimsical tiki or skeleton paintings. Serenaded by coqui frogs and frequent downpours, Jacob creates his unique vision of Hawai’i by combining its legends, myths, and cultures with imagery from his Mexican heritage. Right out of High School, Jacob spent five years in the army, with a deployment to Kosovo, after which he was ready for a big change, and moved to Hawai’i where he earned his BA in Art and was properly introduced to the icon of the tiki. April has been passionate about art since she was a child. Moving from her home state of Virginia to the beautiful state of Hawaii, only amplified her love of color and creating. Growing up in a very creative household, it was not long before she found a medium that suited her own approach to art. Colored pencils and pen & ink eventually became her avenue to adding great detail and vibrant color to her subjects. Inspired by the sea and its creatures, she loves bringing each piece to life with her own special twist. Having spent over 25 years in the mortgage industry in Valencia, CA, Andy decided to pursue his artistic endeavors full time after relocating to Hawaii in mid 2015. 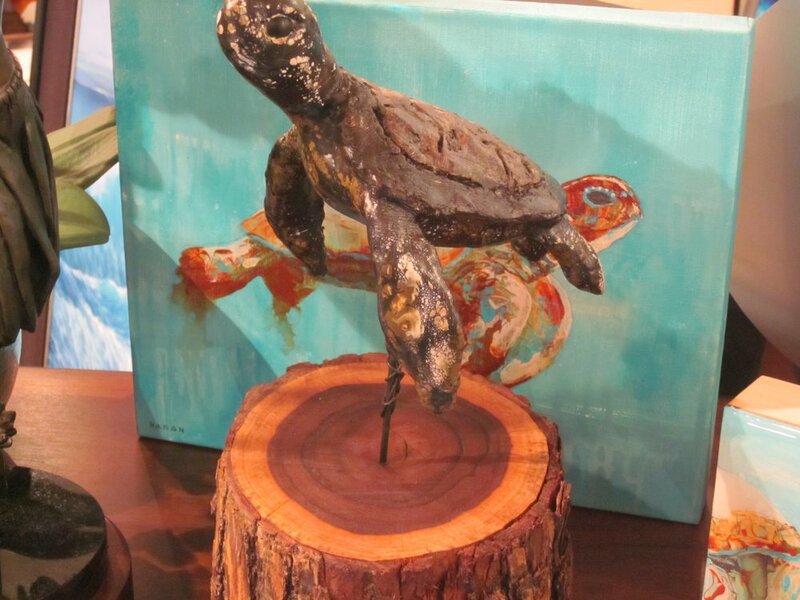 “Art is front and center,” says Andy, a resident of Ko Olina. 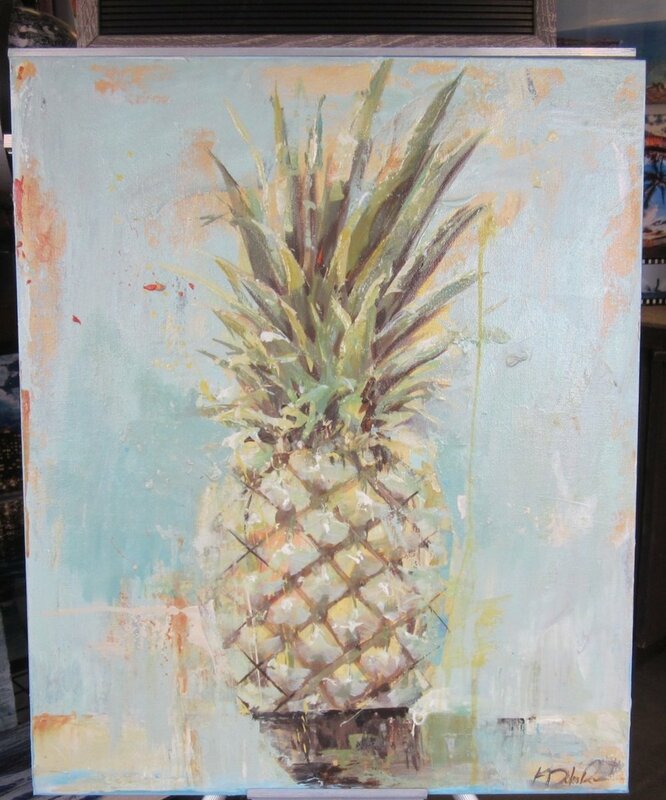 “My passion is everything Hawaii and as an oil painter I want to capture the vibrant hues only Hawaii possesses”. Andy finds mixing most common colors not suitable for the palette of colors here in Hawaii. “Vibrant aqua, teal, and the soothing texture of ocean waters are hard to put down on canvas. It has taken great practice understanding how colors from the tube don’t necessarily represent the glistening, translucent colors present here in Hawaii”. The challenge of capturing the colors of these islands continues to be Andy’s obsession. All local art, conveniently located in Ko Olina Station. Gallery Olani gets the works of talented artists into the hands of both kama'aina and visitors from all over the world. Visit us and discover your new favorite piece, or a great gift for a friend or member of your ohana. Join us every Aloha Friday for pupus and an opportunity to meet our fantastic artists. Take H1 West to Kapolei. H1 will turn into HI-93 W. Take the exit for 'Ko Olina,' on the right. Take a left at the first light, the gallery will be on the right. Enjoy free parking at Ko Olina Station.